I think this Attitude of Gratitude frame is my favorite Thanksgiving project to date and has a little more meaning. It all started when I was searching for ideas on Pinterest for a Thanksgiving craft to do for our monthly craft club as November was my month to host. It's hard to find something that 12+ people will like and isn't covered in turkeys. Then I stumbled upon this beauty from Catherina's Creative Corner. It is the perfect project to get you in an attitude of gratitude. Michael's is having an amazing sale on frames right now! Step 1: Cut your paper down to the size you need it. Then draw light pencil lines on you paper as a writing guide. Step 2: Using a pen, write down the things you are grateful for. My handwriting is atrocious but I think it adds a little bit of charm when its in your own script. Of course you can always print off what you are grateful for and slide the paper in your frame. This step was actually a lot of fun. I had to sit down and really think about the things I'm thankful for and got past the typical answers; family, food, shelter, etc. Of course I added all of those but that only took up a small portion of my paper so I had to get a little creative and go through my life and evaluate. Now pardon me for a minute and for being a girl but I am thankful for tampons. This is one of those things I think about all the time but rather than write "tampons" on a piece of art to be displayed in my home I opted for hygiene products which include things like soaps, shampoos, razors, etc. After having my house hit by a tornado... I'm thankful for sunny, clear days. I'm thankful for airplanes that let me see my family more often. Pedicures, I'm thankful for pedicures. You get the idea. Step 3: Place your paper in your frame. 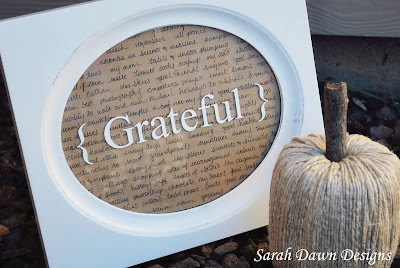 Cut out a piece of contact paper, remove the backing, and place it over your vinyl letters. *All the negative space vinyl should already be removed. * The contact paper is to help you transfer the letters to the glass in your frame and keep them straight and evenly placed. Once your contact paper is on top of your letters, remove the backing from your vinyl. Step 4: Find the center of your glass and place your letters on top of the glass. Press down firmly. Carefully remove the contact paper, making sure your vinyl letters stay on the glass. I did this step with the paper and glass already in the frame. That's all there is too it. You can erase the pencil lines if you want but I thought it gave mine a little more character. Like I mentioned before, we did this project for our monthly craft club where someone suggested that you could even keep this up all year round as our hearts should always be full of gratitude. I think in a couple of years. I'll take the paper out and re-write the things I'm grateful for just so I can sit down again and really ponder on all of my blessings and again dive into an attitude of gratitude. Beautiful!! Thanks for partying with us this week at Keep Calm & Link Up!! Happy Friday!! That is so pretty and such a great reminder for the season! So simple and special. I love everything about it! Beautiful Sarah, I love the book page paper with the white frame. Here from the POP party and pinning away! This is a fabulous idea. I love it. Love this! Definitely pinning it.... An attitude of gratitude is so important, and this is a lovely reminder. Wonderful project. This is perfect nonturkey project. Thank you for sharing it at Our Favorite Things Link Party this week. I love it! I stopped by from Debbiedoo's and so glad I did. I'm a new follower and look forward to seeing more of your creativity. It's just the perfect balance of serenity, peace, and gratefulness.... as well as good taste! Thanks you for sharing! Thanks for sharing this original idea on Simple & Sweet Fridays. 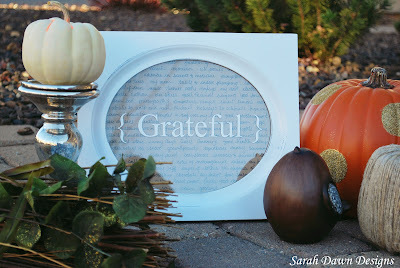 It's perfect project for Thanksgiving! What a beautiful project - my mind is reeling with xmas possibilities for this - I have words in frames all of the house - but this is really special! This turned out beautifully! Such a great project for Thanksgiving. You're a STAR over at I Gotta Create! 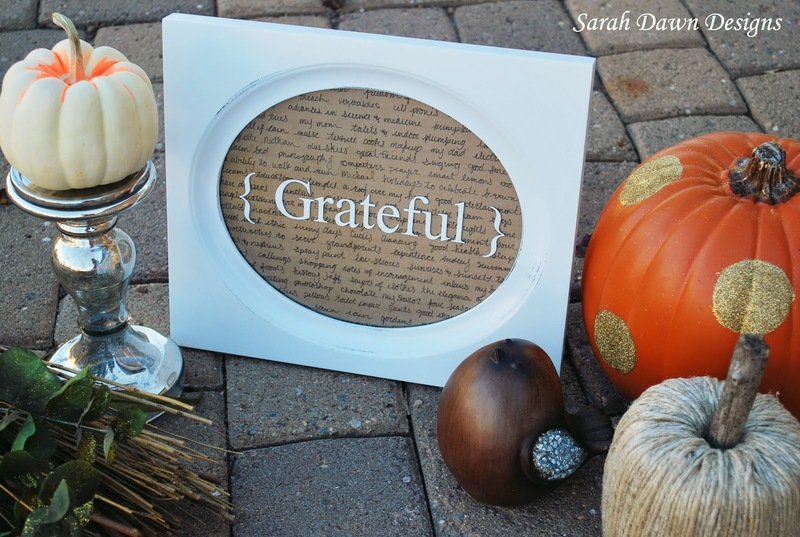 Featuring your lovely gratitude frame today. Thanks so much for linking up with the Wildly Original Crowd. Love the oval frame opening! Thanks for the motivation!...something like this has been on my to-do list for awhile now. I think I'll try to get to it TODAY! Yours is so beautiful! Hi Sarah, what a sweet idea, and it looks great. I found you over at the 36th Avenue, and I'm your newest follower. Have a great day! I love this! What a great way to be mindful of all that we already have and super cute also! I would love it if you'd come share this with us over at Real Housemoms for Fabulous Fridays! Lovely... the white text is perfect! This is a great idea and it turned out so very pretty!! I can't wait to try this out! 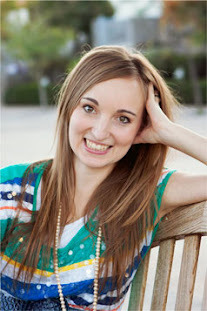 I found you on sixsisterstuff!! I'm your newest follower! Can't wait to see more! Sarah, this project is beautiful! I love that you can change your list every year! Pinning! Thanks for linking up at One Creative Weekend. I'll be featuring this idea tomorrow morning! Feel free to grab a featured button, and I hope to see you back this. Happy Thanksgiving!